Wio News: Typhoon Rumbia, packed torrential rains and strong winds, made a landfall in east China’s Shanghai on Friday morning, disrupting traffic, suspending ferries, flights and trains. 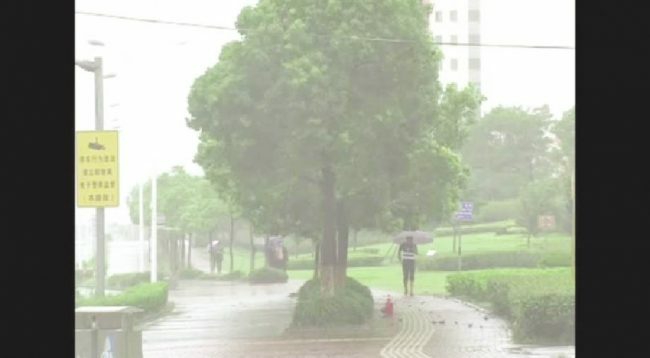 Shanghai weather observatory on Friday morning issued a yellow alert for typhoon Rumbia, and upgraded it to orange as heavy downpour continues. China has a four-tier, color-coded weather warning system, with red representing the most severe, followed by orange, yellow, and blue. Strong winds kept battering the coastal area of Shanghai, with a wind force reaching 12 on the Beaufort Wind Scale. Strong winds and huge waves forced three ferry lines to close. Amid gales and downpours, a Yangtze River bridge in Chongming District also closed to traffic. By Friday morning, altogether 149 flights at Pudong and Hongqiao airports and over 111 trains to China’s southern coastal areas have been canceled. Typhoon Rumbia is the third that had made landfall in Shanghai this month, which is forecast to affect Shanghai till Saturday.